Between August and April, the Lower Fraser tributaries offer a rather exciting yet challenging fishery. Coastal cutthroat trout is a target species that anglers both love and hate. They are at times elusive, making them extremely hard to catch. When they enter a feeding frenzy, these cutthroat trout are hard to keep off the hook. Their willingness to chase down an artificial fly or lure, their diverse colours and spottings are the reasons that anglers pursuit this species continuously despite of the possibility of multiple failures. In August and September, they are found throughout the Fraser River and tributary mouths. During this period, they feed on whatever food items they come across. As spawning salmon return into streams, they begin gathering in streams, staging behind spawning salmon so they can feed on deposited eggs. During the winter months, mature adults spawn in the same channels while young feeders feed on salmon carcasses and small inhabitants in streams. When spring arrives, their feed changes to nymphs and juvenile salmon that emerge from gravel beds. This article is an introductory guide to the Fraser Valley cutthroat trout fishery. I will summarize the fish species that you may encounter, regulations, fishing techniques and other important information that you may need to know when taking part in this fishery. Beside the primary target species in this fishery, there are three other species that anglers may often encounter. You must use a single barbless hook. You can only use one fishing rod at a time in streams. You can only retain two hatchery-marked trout per day in streams (and some lakes) and they must be over 30cm long. It is important to check the regulations for changes and updates regularly. For fish that you have to release, please do so with care so their chance of surviving remains high. Weighing less than 2 pounds, coastal cutthroat trout can often be confused with coho jacks or rainbow trout, especially in the estuaries where they lose most of their freshwater characteristics. In rivers and lakes, coastal cutthroat trout are very spotty from the back to the abdomen and have somewhat of a darker body colouration. In estuaries, they are still very spotty across their entire body but their body tends to be very silver. The easiest way to identify them is by looking for a orange/red lining that is located below their gill plates. Bull trout belong in the char family, which are closely related to trout. They are much easier to identify due to a few distinct characteristics. Look for the white spots across the back. Pink spots can also be found along the lateral line. The size of a bull trout found in the Tidal Fraser River can vary, from less than 1 pound to 10 pound. Mountain whitefish may look like a minnow, but it in fact belongs in the salmonid family. Their body is usually scaly, their wide tail is forked and like other salmonids, they have an adipose fin. Average size of mountain whitefish is 25 to 35cm, but they can reach up to 45cm. Northern pikeminnow belong in the minnow family. Like other minnow species, they do not have an adipose fin. Their fins are often yellowish. Their body colour varies from silver, grey to brown. Their mouth is big and the shape of their head almost resembles a northern pike's head. Most northern pikeminnow that you would encounter in the Fraser Valley are between 1 and 4lb. 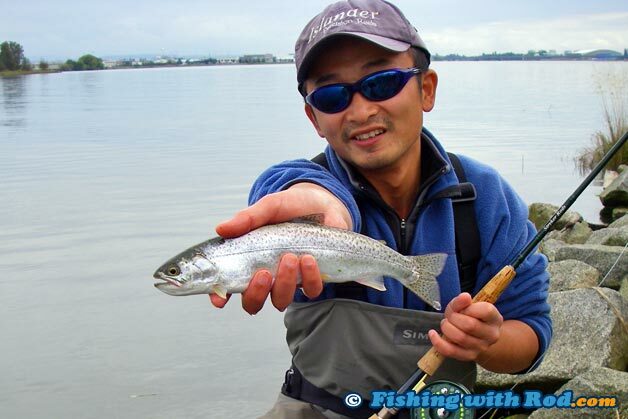 This fishery can be done by either fly, lure or bait fishing. The easiest way to catch a cutthroat trout is by float fishing with bait. The setup is similar to what you would use when float fishing for salmon, but you need to downsize your tackle because your target species are much smaller. A small, thin float that only requires 5 to 10g of weight to balance is ideal. The length of your rod should be more than 6' long if you are using a fixed float. Your hook size should be size 2 to 6. Typical natural bait used for cutthroat trout are dew worm and roe. In streams where a bait ban is in effect, you can use artificial bait that is not scented. These can be small plastic eggs, jigs, plastic worms. Cutthroat trout are usually aggressive and will always chase down a moving object when presented. A small spoon or spinner, which imitates juvenile salmon or sticklebacks, can quite often outfish all other techniques. A shorter spinning rod is more ideal for this technique. Lure size between 1/16oz and 1/8oz is ideal. The size of the hook on the lure should be either size 2 or 4. Fly fishing for cutthroat trout is a challenge but very rewarding when fish are connected. A 4wt fly rod is ideal because most fish are no bigger than 2 or 3lb. Your fly fishing reel should be spooled with either floating line or clear intermediate sink line. These two lines are required to cover all types of water where coastal cutthroat trout are found. In late fall and early winter, egg patterns fished under a strike indicator can be deadly when fish are heavily feeding on salmon eggs. Throughout the winter months, small nymphs being slowly stripped in is effective on overwintering feeders. In late winter and early spring, a small minnow pattern that is being stripped in rapidly almost never fails if cutthroat trout are feeding on salmon fry. The Fraser Valley cutthroat trout fishery is a hunting game. Because fish are often highly mobile, success is hard to achieve by remaining stationary when fishing. By moving from spot to spot, you are likely to encounter more fish. Cutthroat trout often travel in small schools. In the winter, they are less visible by feeding mostly subsurface, while in spring and summer they are more likely to show themselves on the surface during feeding. Don't be discouraged if you are unable to find fish during your first few outings. Seasoned cutthroat trout fishermen will tell you that fish encounters are unlikely over 90% of the time when you are chasing cutthroats. Because this is primarily a catch and release fishery, there are a few precautions one should take. When bait fishing, your hook size should not be too small so fish do not swallow the hook deeply. When lure fishing, your hook size should not be too big to prevent creating too much damages on small fish. Hook size selection is definitely a balance that one learns over time. I generally stay with size 2 or 4. A catch and release net can come in really handy in this fishery. This allows you to handle your catches safely in the water and gives you enough time to take the best photographs that you want from the fish. Cutthroat trout caught in late fall and early winter are known to be poor table fare due to the food items that they eat (flesh from rotten salmon carcasses) so releasing them maybe a better idea. In the winter months, you might also encounter more spawning cutthroat trout. These are much darker in body colour. It is also best to release these fish so they can reproduce and sustain the population.